Royal French Manicure Short Square Nails. Strong And Resilient Glue On Nails. 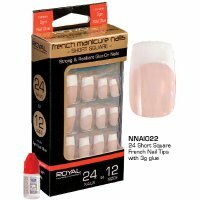 Contains 24 Beige Nails In 12 Sizes Plus 3g Nail Glue.